In today’s globalized environment, expertise in international affairs is essential to understanding the contemporary world. Chapman University’s Master of Arts in International Studies is a two-year interdisciplinary course of study that links global theory and practice. The International Studies program is designed to prepare graduates for a range of global careers with the U.S. Foreign Service, nongovernmental organizations (NGOs), the United Nations (UN), and other global entities. The Master of Arts in International Studies program is distinctive in its interdisciplinary approach to understanding global challenges through its emphasis on applied and experiential education. International Studies students have the opportunity to work with faculty from various disciplines including Political Science, Sociology, Economics, Communication, Peace Studies, and Law. International Studies faculty bring their extensive research and professional experience from around the world to classroom. The International Studies program enhances students’ cross-cultural professional skills through an immersive 240-hour internship experience, chosen from a variety of international careers in non-profit, humanitarian and development work, diplomacy, education, and business. International Studies students culminate their degrees with the MA thesis, which analyzes contemporary global challenges. The International Studies program immerses students in culture and real-world inquiry, offering the language and professional skills necessary to succeed in the global marketplace. The MAIS program includes a stipend toward internship costs for all students, as well as generous, competitive tuition and research scholarships. Students complete 39 credits of academic coursework, demonstrate proficiency in a foreign language equivalent to having completed two courses in the language at the 300 level, complete a 240 hour international internship, and successfully complete a master's thesis. MAIS students complete an international internship between their first and second years of study. These internships immerse students in culture and real-world work overseas, enhancing language and professional skills in the field to which they aspire. For example, past students who hoped to pursue a career in the NGO arena participated in international internships with Global Vision International, the Foundation for Sustainable Development and others. Students may work with non-governmental organizations in Africa to help alleviate poverty, promote gender equality in Latin America, explore trade issues among countries or firms in eastern Asia, investigate human rights issues in Europe, or assist in developing policy briefs for the U.S. State Department. MAIS internship funding automatically reimburses up to $2000 in expenses for every MAIS student. Further Internship funding is applied for through Wilkinson College’s graduate student Scholarly/Creative grants program. The International Studies MA thesis has a substantive international focus and incorporates theoretical perspectives. Theses are analytical, and may analyze secondary data or original empirical data collected by students. International Studies students select their thesis advisors and committees based on our core faculty research interests. MA thesis fieldwork may include surveys, interviews, or observations. Students may apply for research funds of up to $1,500 to cover fieldwork expenses. Funding is also available through Wilkinson College’s graduate student Scholarly/Creative grants program. February 1 – Priority deadline to be considered for fellowships and scholarships. All fall applicants will be considered for fellowship and scholarship awards. Chapman’s International Studies program offers competitive full and half-tuition fellowships to exceptional applicants. To be considered as an International Studies Fellow, applications must be received by the February 1 deadline. Applications received after this deadline will be considered on a rolling basis as space is available. A graduate admission test is required for applicants with a bachelor's degree cumulative GPA below a 3.0. Applicants with a GPA between 2.5 and 2.99, may be considered for admission by submitting a satisfactory Graduate Record Examination (GRE) with minimum scores of Verbal: 154, Quantitative: 147, and Analytical Writing: 4.0 or by demonstrating significant relevant professional experience. GRE Institution Code: 4047. Two letters of recommendation, including one from an academic source, which describes your professional and academic abilities. Submit an essay expressing your reasons for wanting to join the MA International Studies program. What are your personal and career goals, and how will this particular degree from Chapman University help you reach those goals? Your essay should be double spaced, size 12 font, and 2-4 pages in length. If you would like to set up a visit to Chapman University to meet the director of the MA International Studies Program or sit in on a class, please contact Allison DeVries at devries@chapman.edu. The International Studies Program has funding for international internships built in. Students embarking upon their required 240-hour international internships receive up to $2,000 toward their internship expenses. Students may apply for International Studies research funds of up to $1,500 to cover thesis research fieldwork expenses. Additional funding for thesis research fieldwork and travel to conferences is available through Wilkinson College’s Scholarly/Creative grants program for graduate students. Additional fellowships are available through the Master of Arts in International Studies Program on a need and merit basis. 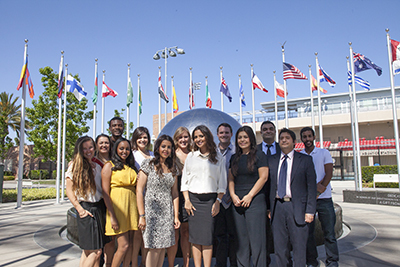 Chapman University offers excellent financial support to students. Explore Chapman's generous fellowships, scholarship and loan programs to help you get started today. Please contact a financial aid advisor regarding the financial aid opportunities available to you. The Master of Arts in International Studies program offers an accelerated program option for undergraduates that enable students to begin taking MA coursework in their senior year and receive a Master of Arts degree within one year of finishing their undergraduate studies. The program is open to all undergraduate majors that have satisfied the prerequisites for the program and meet the admissions requirements. This interdisciplinary course of study is designed to train students seeking global careers with the U.S. Foreign Service, nongovernmental organizations (NGOs), the United Nations (UN) or businesses. Current Chapman students applying to the accelerated Masters degree program do not require the recommendation letter in their application. Instead, please enter the name, email and phone number for two faculty or staff members at Chapman who support you as a candidate for this program in the online application.